PHORMALAN DYES are effective easy-to-use liquid dyes for flax, raffia, and other similar fibres. Just put flax in water, heat to the boil and add dye and watch. Rinse, enjoy. The name Phormalan is owned by Teri Dyes. It’s a trading name for the range of dyes we developed for dyeing Harakeke/ NZ flax – the common names for Phormium Tenax. The dyes are supplied in ready-to-use liquid form for weaving strips or flax fibre. Harakeke/NZ Flax. Similar plants inc e.g. other Pacific flax; also raffia. Phormalans are recommended for use with dry fibre, though many customers do use flax still green. Is there certainty when dyeing with Phormalans? What has to happen for Phormalans to work? Phormalan Dyes will only dye fibre and stay fixed if the fibre is immersed in a boiling dye solution. How should Phormalan be used? It doesn’t seem to matter how long the fibre is boiled – as long as it is boiled… but with most colours, the longer it is left boiling, the more dye will be taken up by the fibre, and a darker shade will result … and that is not always what was desired. NB: Phormalan Dye cannot effectively be applied other than by boiling together with the fibre. It can’t effectively be brushed on as a paint, or dipped in as a stain. It doesn’t seem to matter how much water is put in, as long as there is enough to cover the fibre. All the water that is there at the beginning is still there at the end, less steam. How much Phormalan dye is needed? It does matter how much Phormalan dye (as supplied) is added … add in proportion to weight of fibre. Place the flax or raffia to be dyed in a suitable sized container and cover with hot water. Heat to boiling. Add the required amount of liquid dye and hold just below the boil until the required depth of colour has developed. Remove the dyed flax and wash thoroughly with cold water to remove any unfixed dye. NB: Some users prefer to add the dye before bringing to the boil … that works too, but without the same opportunity for colour depth control by quick removal. There is no known advantage in adding salt using Phormalans … some folk do anyway! If there is still dye left in the dye pot at the end of the dyeing, the dye liquid can be reused. The colour second time around will not be as intense as the original dyeing and may also differ somewhat in shade. If however the flax that was dyed first was green/fresh-picked, then the flax juice that has gone into the dye solution when first used may have fermented over time and spoiled the solution against future use. Anything boiling is not safe. The dyes as supplied are mildly acidic. They are not particularly hazardous to users or the environment, but they do stain and should be used with adequate ventilation, and diluted extensively before disposal. It’s probably wise to not use the dye pot for food afterwards. Dyes containing any of the three Yellows or F2 Blue need to be shaken before use … some of the dissolved solids settle out, especially in cold weather, but readily shake back in. Unless F1 Black is used (and kept) strong can produce a green or a blue. The dye on neck of the F2 bottle looks purple, it’s not trying it b4 complaining! Sometimes fading from sustained bright sunshine. For a colour chart and price list of our flax dyes please go to our Downloads page. 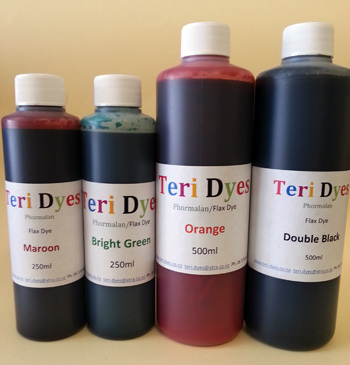 If you would like to download a full guide to dying flax using Teri Dyes products please go to our Downloads page. To purchase our flax dyes please visit our store.